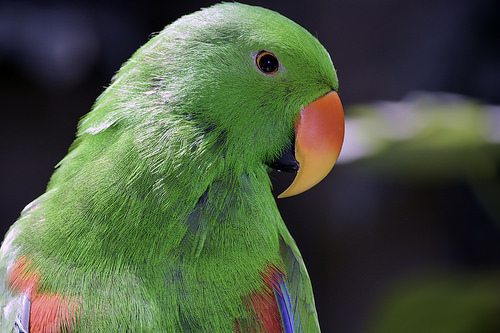 Pets Costs > How Much Do Eclectus Parrots Cost? How Much Do Eclectus Parrots Cost? The Eclectus Parrot (Eclectus roratus) is native to the Solomon Islands, New Guinea, Northeastern Australia, and the Maluku Islands. The Eclectus is deemed by many to be the most stunning parrots out of over 350 species. The Eclectus parrots are not just fine-looking; they are also excellent chatterers, copying countless words, expressions and phrases. They can even sing songs that are commonly presented to them. If you happen to have more than one Eclectus parrot, they will speak and sing not only to their owners and human friends but to one another as well. How much does the Eclectus parrot cost? There are four commonly available Eclectus subspecies: the Solomon Island, the Grand, the Red-sided, and the Vosmaeri Eclectus. On average, this bird is going to range anywhere from $600 to as much as $2,000. A Solomon Island Eclectus, for example, will cost anywhere from $800 to $2,200. Overall, this is going to all depend on the breeder, gender, your location, the species, the quality and age of the bird. Males are said to be 20 to 30 percent more than a female. An older bird, usually three to five years or more, will generally cost a little less than a younger bird. Older birds can usually be found for as little as $300. On BirdsNow.com, a popular online bird classified website, listings can cost anywhere from $800 to a pinch more than $2,000. Most breeders are going to include the parrot in a smaller travel box, while some breeders may give you a smaller cage just for traveling purposes. Some breeders may also include a start-up pack that includes food, toys and certain accessories. Reputable breeders should include certification papers, up to date vaccinations and health records. This could include the baby hatch certificate and vet health certificate. Most should include a health guarantee as well. A large bird cage will cost anywhere from $250 to as much as $1,000. Generally, the more parrots you have, the more space you are going to need. Some owners prefer to have one cage for each bird. Toys are important to keep your pet bird entertained. Although this is optional, it is highly recommended. A typical toy can cost anywhere from $5 to $25 for something such as a ball. Parrots are going to require routine checkups as well as unexpected vet visits. Vet checkups are going to start at about $65. A wide variety of food is necessary such as fruits, beans, vegetables, greens, brown rice, legumes and sprouts. This breed of birds does not do well on all pellet diets or seed diets. If not kept on a specific low-fat diet, they are prone to fatty liver disease. Parrotforums.com recommends budgeting $10~ per week for the necessary food. If the bird needs to be shipped, this can cost about $100 to $300, depending on the distance and option you choose. A bird first aid kit is recommended in case of an emergency. The male parrots have a bright green head, bright candy corn-colored beak, and blue or red tail and wing feathers. The females are red-headed and blue-breasted with black beaks. If purchasing a young bird, see how they eat. Are they eating pellets? Are they water bottle trained? It’s often a lot easier to buy a trained bird rather than train it at home. It’s also wise to see how they react with humans. While it can take years to create a bond, some hand-reared birds don’t react well if taken away from a home they are comfortable with. Health issues may include nostril discharge, constricted toe syndrome, dull beaks and heavy metal poisoning. Talk with a few local breeders in your area. Check local adoption centers or online classified ads as some people may need to get rid of their parrot for various reasons. This is a great way to get the bird, along with all the of the necessary supplies. Buying in pairs can often bring the individual bird price down.